Color is starting to spill down the mountainsides once again. I recently received an email from a reader asking about the different fall colors and directions for some good viewing so I thought I would pull that information together from some past columns for a little refresher. 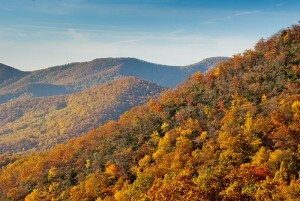 Although fall foliage is broadly classified as red, orange or yellow, the southern Appalachian forests are bathed in a varied collage of shades and hues. Yellows run the gamut from the lemon-colored tulip poplar to the golden hickories. Crimson maples and maroon sourwoods are lumped as red. Oranges range from the grapefruit colored basswood to the burnt umber of beech and white ash. Many factors contribute to the myriad of fall colors. The physiology of the species, the health and vigor of the particular specimen, soil types and climatic conditions are just some of the parameters that come into play. The genesis of the color change is the approaching winter. Hardwoods shut down photosynthesis and go into a dormant state during the winter. The xanthophyll and carotene pigments responsible for the yellow and orange fall colors have always been present in the leaves. During the spring and summer growing season they are masked by the production of chlorophyll, which is responsible for the green color. As photosynthesis is curtailed and chlorophyll production ceases the xanthophyll and carotene become visible making the leaves yellow and/or orange. The reds are a different story. The red pigment, anthocyanin, is not present in the leaves. In order to shed their leaves for the winter, woody plants produce a layer of cells, called an abscission layer, between the stalk of the leave and the branch. The abscission layer cuts off the flow of nutrients between the leaf and the tree, trapping whatever sugar may be stored in the leaf. When these sugars are exposed to sunlight and cool temperatures a chemical change takes place, producing the anthocyanin and creating the red color. When one stops to consider all the variables involved, two things become evident. There will be a kaleidoscope of color produced each autumn. Predicting the date and intensity of peak season is a game of chance. 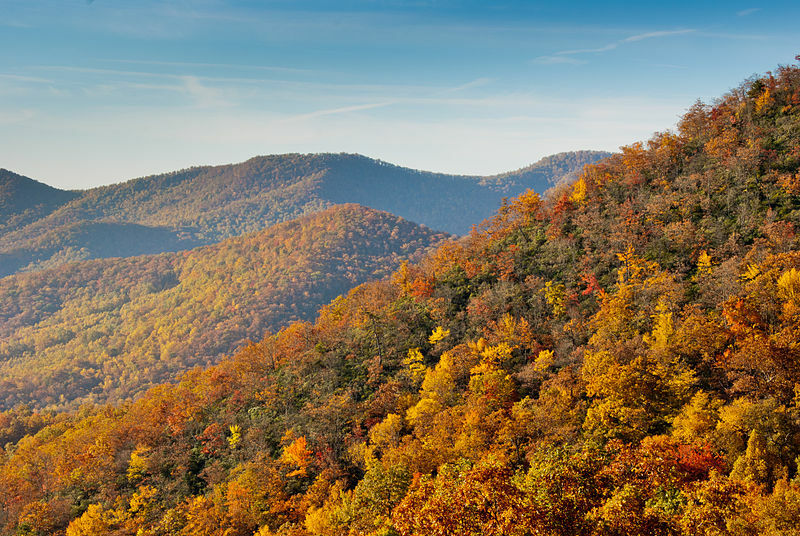 In WNC, peak traditionally occurs between mid and late October. Good color is easily observed before and after this date. Good color is beginning to appear now at higher elevations. The higher reaches of the Blue Ridge Parkway — like Graveyard Fields, Black Camp Gap, Waterrock Knob and Heintooga Spur — are starting to produce local pockets of color. Past peak, one will want to cruise the valleys, like Cataloochee and Cades Cove, to enjoy the last remnants of the season. And here is a great “leaf trip.” Directions begin with Waynesville but it’s a loop so you can access it wherever it’s most convenient. This drive will allow you to experience a variety of habitats and elevational changes. Take U.S. 276 south, from Waynesville, through the rolling farmland of Bethel. From Bethel, take N.C. 215, through the Shining Rock Wilderness, over the Blue Ridge Parkway, and down to Rosman. In Rosman, pick up U.S. 64 west through Lake Toxaway, Sapphire Valley, Cashiers, Highlands, and down the Cullasaja Gorge to Franklin. From Franklin, take U.S. 23/441 north, over Cowee Mountain, to Dillsboro. In Dillsboro, take U.S. 23/74 east, returning through Balsam Gap to Waynesville.